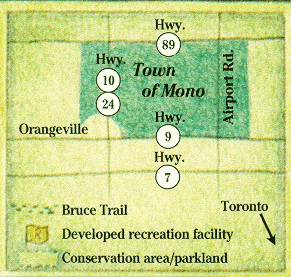 You've probably driven though Mono travelling north to destinations such as Wasaga Beach, Blue Mountain or Creemore. Why not stop and explore our natural beauty, trails and artisans as part of your trip? Mono is flanked by Highway 9 to the south and Highway 89 to the north. 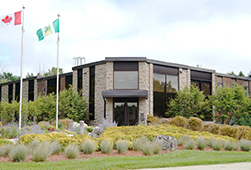 Airport Road (also know as County Road 18) is close to our eastern boundary and Highway 10/Hurontario Street is our most western major roadway. We are in close proximity to Toronto, in fact, a mere 45 minutes to the north west. A drive up Airport Road, Highway 410 and Highway 10 will put you in Mono. If you are on Highway 400 and travelling from the north, take the Highway 89 exit west and head to Rosemont (via Cookstown and Alliston). You'll know you've reached Mono when you see the large Hills of Headwaters sign on your right before you come to the town of Rosemont, also home to the Globe Restaurant. The Highway 9 exit west off Highway 400 will also put you in the southern end of Mono. Please do stop by and visit with us and explore Mono.